This entry was posted in Blogging, Friendship, Writing and tagged acknowledgement, awards, Blog, blogger, blogging, friends, innermost thoughts, Sunshine Award, writers by mycookinglifebypatty. Bookmark the permalink. Thanks for the nomination! And congratulations; you certainly deserve the award. You are very welcome! I love reading your blog. Congratulations on the award, Patty! It is lovely to be acknowledged, oh, isn’t it? I am very happy that you included me in your list of Sunshine Rays even though I probably won’t be playing along. Snail-mail letters are great, aren’t they? Perhaps one day we should exchange one! 🙂 Thank you again. Thank you Kathy Cupcake. Yes, I’d love to exchange a real letter with you! You are welcome, Danny! 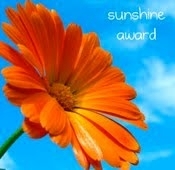 Have fun spreading the sunshine around! And to you too, sister!